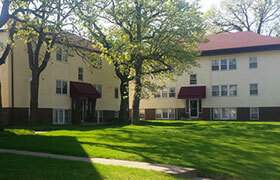 Oak Terrace Apartments feature clean and reasonably priced studios and 2-bedroom apartments in South St. Paul. The community offers free parking in its surface lot, responsive maintenance and controlled entries. Heat, water, sewer and trash are included in rent. The property overlooks Wakota Arena atop the bluff. Oak Terrace Apartments are pet-friendly, welcoming cats. Check out some of our latest photos from around the property.